The streamlined BFD Eco promises top-notch acoustic drum sounds at a budget price. If you like to get super-picky about controlling your drum samples, there are some excellent top-of-the-range virtual drum instruments to choose from, but, of course, they come at a cost and can consume plenty of computer resources. So what about a 'cut-down' version of the same technology? BFD Eco is intended to be just that: FXpansion have attempted to supply the key elements of their flagship BFD2 product, but without the price or resource hit. So does BFD Eco still pack enough punch to get the job done? 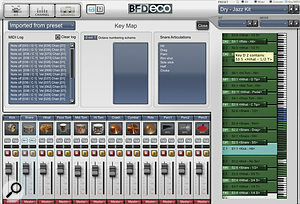 Eco is provided on a single DVD-ROM containing both stand-alone and VST versions. As expected, given the lower price point, the sample library features fewer kit pieces than BFD2 — five kicks, six snares, 12 toms, three hi-hats, 11 cymbals and a small collection of percussion — but, where appropriate, different articulations are provided and, in total, the library required just over 4GB on my test system. While only stick performances are included (no brushes), each kit piece offers 24 velocity layers, all recorded at 16-bit. Also included are some 1500 patterns in a variety of musical styles spanning jazz, pop, rock, country, blues, hip-hop, reggae, latin, funk and drum & bass. Authorisation is completed online and in my case was hassle free and flexible enough to allow installation on, for example, both a desktop and laptop computer. 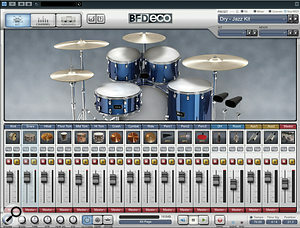 The Channel window allows each drum sound to be customised.On first starting the software, the Kit window is shown in the upper half of the display and can be used to audition sounds. The lower section of the display provides access to all the mixing and effects options and stays in view even when you toggle the upper area between the Kit, Channel and Grooves views. Eco is supplied with 40 kit presets — combinations of the provided drum sounds plus various effects — and these demonstrate that it is possible to coax a very wide range of sounds from the instrument. Whether you want something for ultra-dry jazz, processed R&B, modern pop or stadium rock, there is a preset to get you started. The Mixer panel offers the usual fader, mute, solo and pan options, and individual channels are provided for all the kit elements, as well as overhead and room mics. Two Aux channels (which can be used for send-return type effects) and a master channel complete the line‑up. 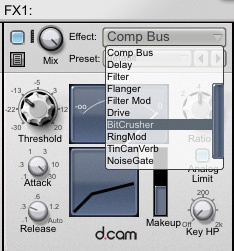 Double-clicking on the drum icon at the top of each channel is a quick way to load a different sound for that channel, while the label strip at the bottom of each channel allows one of the multiple-output channels to be specified if you need to pass individual channels to your DAW for further processing. Beneath the Mixer are controls for master volume, bleed between mics, tuning, velocity dynamics, human velocity (essentially, adding some random variation) and the rather cryptically named V2A, which allows the velocity of MIDI notes to be compressed or expanded. These controls are global and therefore apply to the whole kit. The Groove windows allows drum patterns to be auditioned and sequenced in the drum track or dragged-and-dropped into your DAW.The Channel window offers more control over individual channels. Kit pieces can be selected and adjustments applied to individual drums for parameters such as tuning, dynamics and damping. The selection of controls changes depending upon which drum is being edited so, for example, the snare channel offers a control to blend top and bottom mics, while the hi-hat includes a 'tighten' control to adjust how tightly the closed hi-hat is held. Very neat. Each channel also includes a very flexible four-band EQ section and slots for two individual effects. The effects include gain, compression, delay, filter, flanger, drive, bit-crusher, ring mod, a noise gate, two reverbs and an envelope shaper, so there are plenty of sound-mangling options available if you want to get creative. The Key Map window can be accessed via the small 'tick' icon button – along with ECO's other configuration settings. The 1500 supplied grooves are — surprise, surprise — accessed via the Groove window. Individual grooves can be auditioned or dragged and dropped onto the Drum Track at the base of the Grooves window to build a complete drum performance inside BFD Eco: this is great when you're working with the stand-alone application. Grooves can, of course, also be dragged and dropped onto a MIDI track in your DAW and, once there, subjected to your usual MIDI editing features. In addition, groove effects can be applied, including quantise, human time, simplify and swing. These settings are also applied when the groove is dragged and dropped, and this provides another level of variation that can be derived from the supplied patterns. As I mentioned earlier, the patterns cover a wide range of styles, but FXpansion have been sensible in mixing a healthy amount of bread-and-butter patterns with enough fills and flash to make basic song construction a breeze. Eco offers a good range of effects. I experimented with the plug-in version of Eco via Cubase 6 and, as well as exploring the preset kit and patterns, I also triggered it via a standard MIDI keyboard and an electronic drum kit. The latter proved both easy (although it required a couple of mapping adjustments via the Key Map window) and very satisfying. Eco is responsive and the sounds, despite having 'only' 24 velocity layers, offered plenty of dynamics. However, perhaps most impressive is the quality of the sounds themselves. Yes, there are relatively fewer drums available, but those that are supplied sound great, and a tremendous range of sounds can be coaxed from the basic sample set. I also found the flexibility offered by the overhead and room mics really powerful. The ability to adjust the amount of individual drums present in these channels via the Channel window, and the ability to adjust the stereo width of these channels, provides plenty of variation in how dry or 'roomy' your kit sounds. The effects, while proprietary (they can only be used within Eco, and VST effects cannot be applied within the Eco mixer), are well chosen and add an excellent range of sound-shaping possibilities. Did I miss 24-bit samples? No, Eco still sounds great. Did I miss the MIDI editing? No, I did it in Cubase. Did I miss the multi-channel audio rendering? No, I just worked around it by using multiple outputs into Cubase and rendering individual channels: it takes longer but it works. Did I miss the other bells and whistles? Ninety-nine percent of the time, no. In fact, I found the balance between simplicity and flexibility where needed to be very enticing and I'd be happy to use Eco for serious drum-production work. BFD Eco is listed to sell at £69$99 and is tremendous value for money. If you are super-particular about every last detail of your sampled drum sounds, one of the top-of-the-range virtual drum instruments should still be your choice. 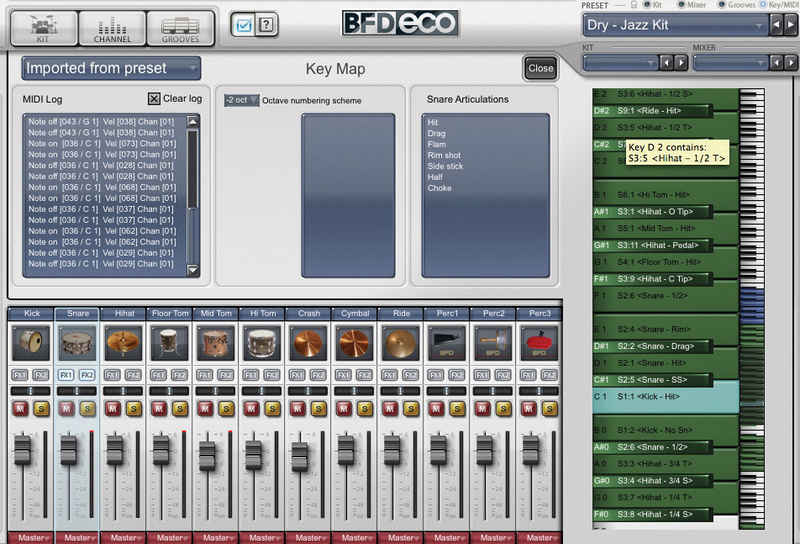 However, if you just want a streamlined route to some top-notch acoustic drums in your tracks and want them at an almost pocket-money price, BFD Eco is just the ticket. Also, Eco works with the range of BFD expansion packs and, if you feel the need, offers an upgrade path to BFD2. I suspect that FXpansion might have a massive hit on their hands here. 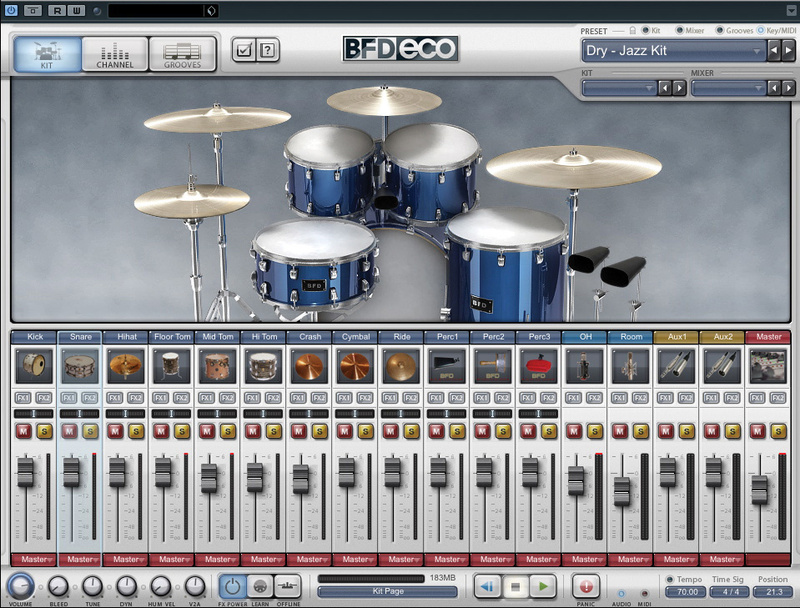 When it comes to up-market virtual drum instruments, we are now spoilt for choice with BFD2, Toontrack Superior Drummer 2, XLN Audio Addictive Drums and the somewhat different approach offered by Sonoma Wire Works Drum Core being amongst the obvious candidates. None of these come especially cheap, though and, in terms of transforming the core elements of this technology into a more compact and affordable package, the most direct competition is Toontrack's EZdrummer. Mac: OS 10.5 or higher, Intel CPU, 1GB RAM, , 6GB hard disk space, DVD drive, Internet connection (for authorisation). PC: Windows XP (SP3 recommended), Vista or Windows 7, Pentium 4 or better, 1GB RAM, 6GB hard disk space, DVD drive, Internet connection (for authorisation). Excellent range of drum sounds possible. None at this price point. Despite missing some of its big brother's bells and whistles, BFD Eco is capable of producing excellent results. For many users, the less complex and comprehensive functionality offered here may well be a blessing rather than a curse, and its price could hardly be more attractive. Sonic8 +44 (0)330 2020 160. Apple iMac Quad Core Intel i7 3.4GHz CPU, 16GB RAM, Mac OS 10.7.2. TC Electronic Konnekt 24D interface. Steinberg Cubase 6 DAW software.